and was planning on incorporating them together somehow. His vision was to attach the LEDs to the jacket and have them facing inwards so it looked like he was “erupting” out of the jacket. After he saw my glasses, he contacted me and asked if I could somehow get the effect he was looking for and make it sound reactive. I accepted his challenge (and his money) and set to work designing. He mailed me the jacket and LEDs, and I had about a week to design, build, and ship the final product to him in time for his next show. The idea is that all of the the R, G, B, and +12 connectors are tied together so that all of the 3-LED segments are actually running in parallel. That means to power it, you just need a 12V power supply that is able to supply enough current. 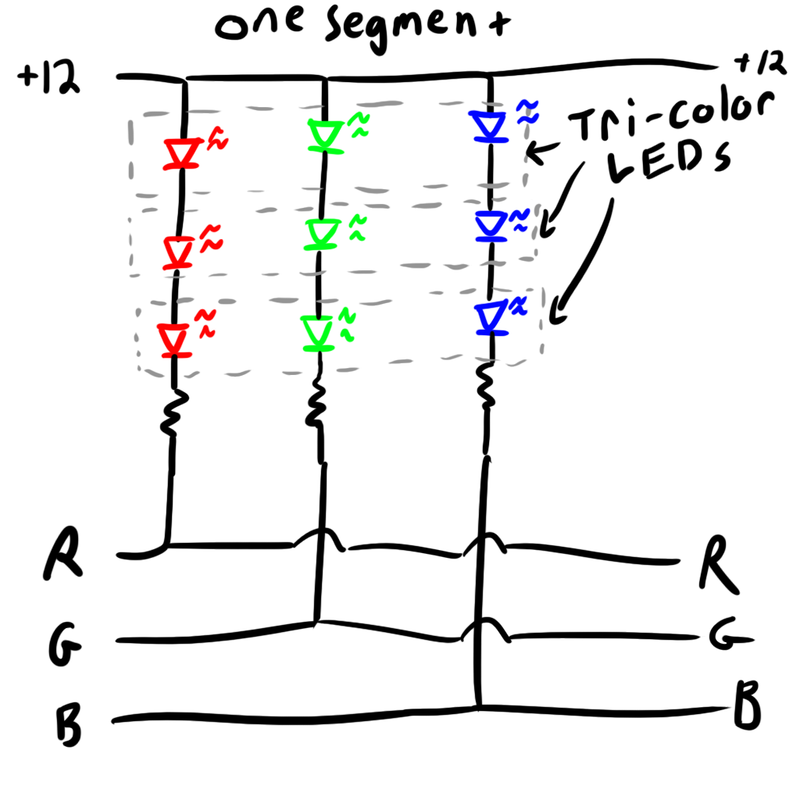 So, I figured that the plan was to supply 12V to the “+12V” line and sink the current through the R, G, and B lines to turn on each LED respectively. 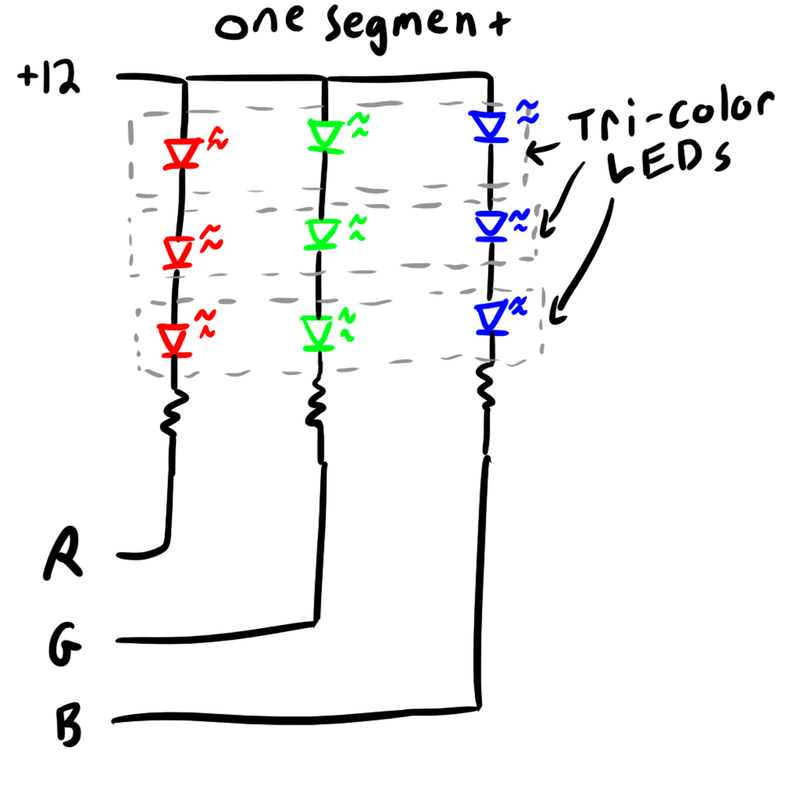 This means that the LEDs are multiplexed though, so I would only be able to drive one LED color at a time. To mix colors, I would have to blink between them in sequence. Those N-FETs are a little scary. They are 3055s, which according to a little internet search are rated for 20A at 60V. I measured the current through the LEDs, and even at full tilt, all three currents summed together never make it over 1.8A. A little over-engineered I guess. The FETs I used in my design were rated for 1.7A continuous which is fine considering that all three together barely break that limit. I was going to need around 12V to power this circuit. 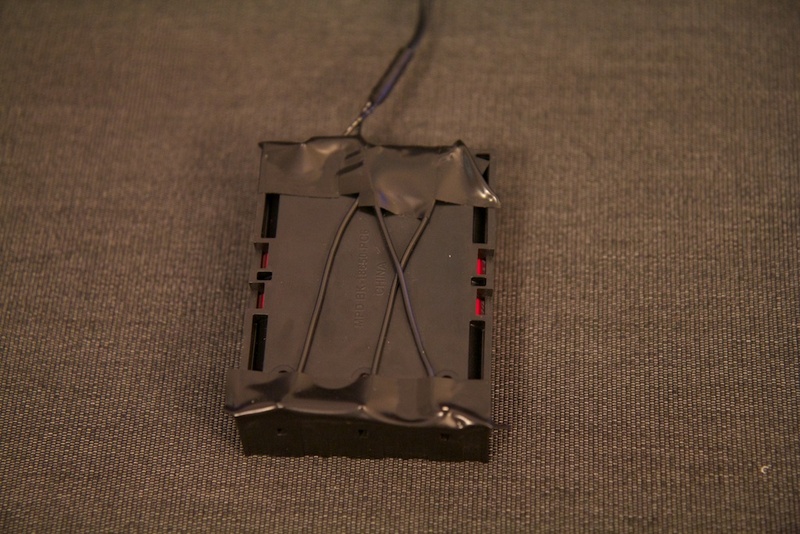 I really wanted to make it battery powered, but the current draw was going to be in the 1-2 Amp range, and at 12V, that would add up to a lot of D Cells. I decided to instead go with Li-Ion batteries. 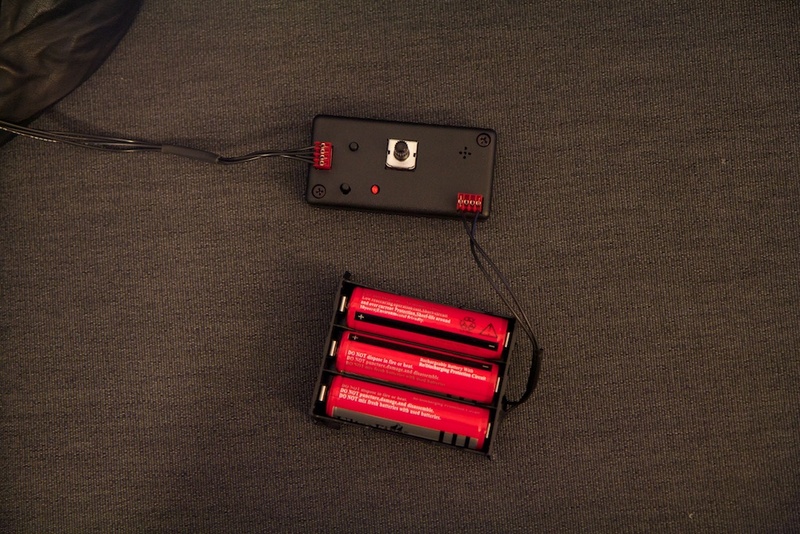 I purchased a pack of 18650 battery cells with a charger off Amazon. 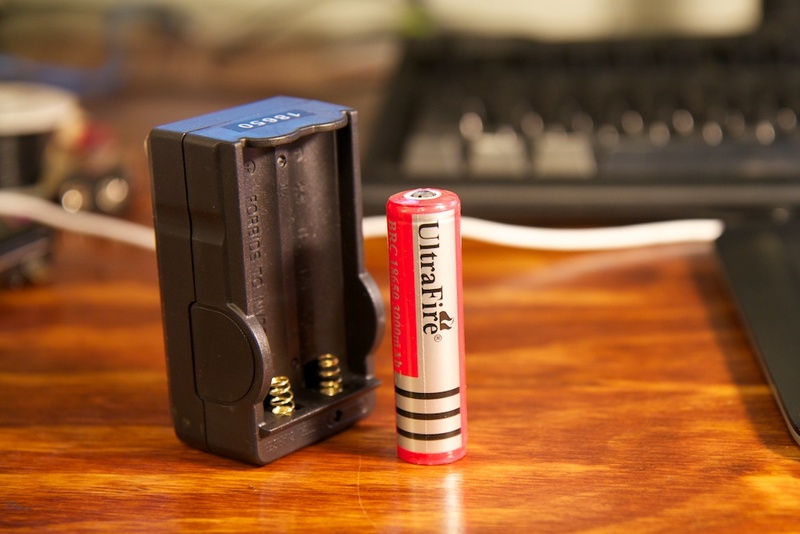 These batteries are sort of like super-sized AA batteries and are each rated for 3000mAh at 3.7v (given the price, I’d be surprised if they make it over 2200mAh, but that’s still not bad). 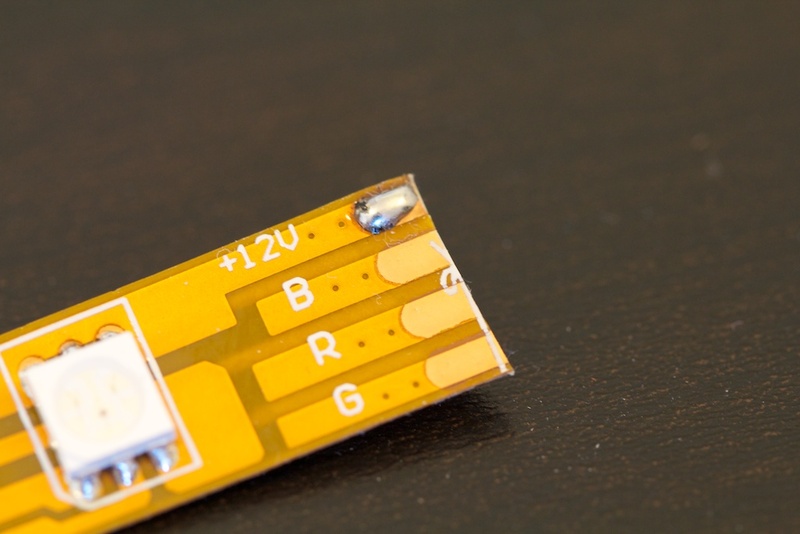 I know that Li-ion cells can break if you over-discharge them (even if these claim to have integrated protection circuitry), so to use them, I was careful to include some sort of low-battery indicator/shutoff. I decided to go digital with the LED control in this circuit because it would be too difficult to get the LED mixing right with all the different color options using analog circuits (plus, if the client changed his mind about something, it would be easier to alter some code than make major schematic changes). This also allowed me to add some neat features like the low-battery indicator light as well as two buttons: one changes the color and the other switches the mode of the lights (flash to music, stay on all the time, and stay off all the time). There isn’t much to be said about my micro controller code. I used one of the onboard timers to handle the LED PWM. There’s a look up table for different color mixings at every brightness value (64 available). All the micro-controller has to do is pick a brightness value based on the ADC voltage and set the duty cycle of the LEDs to match the appropriate value on the lookup table. 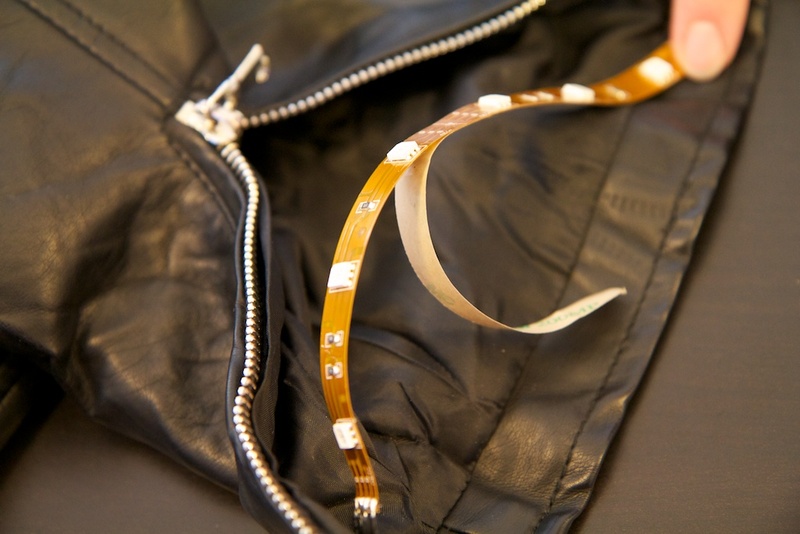 The framework of the audio circuit was more or less copied from the glasses, but with some changes. Rather than using the half-rail biasing trick, I decided to include a charge-pump inverter (U5) that takes my +5 rail and gives me a -5 rail to power my op-amps so I could do a proper GND bias. This was important because I am reading my envelope into a micro-controller’s ADC which can only measure from 0 to 5V and I wanted to give it as much range as possible. One thing I noticed that was very interesting was that in the glasses, R13 was a 50k resistor which puts the RC time constant of the envelope detector at .5 seconds. This means that it would take around 2 seconds or so for the envelope to die down after an impulse. This is way too slow. I’m not entirely certain why it worked so well in the glasses, but for this project, I changed it to 10K (.1s time constant). 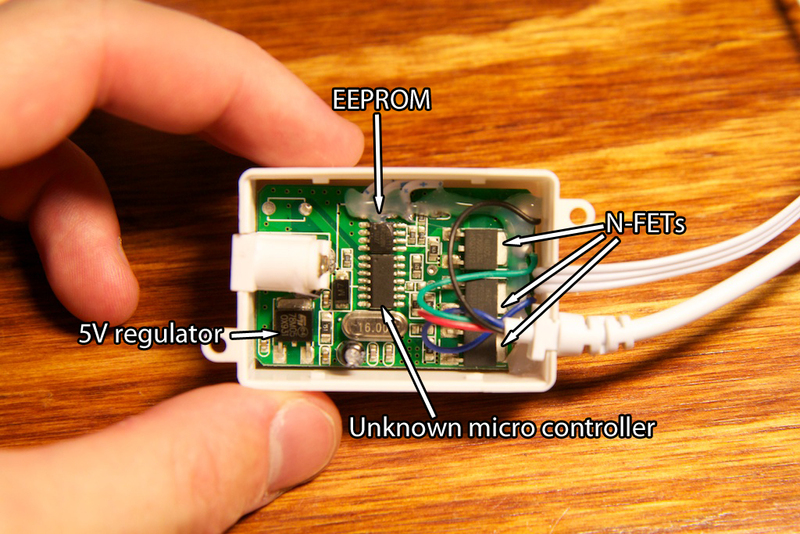 I programmed the micro-controller using a little adapter cable that would connect the six pins of the programmer to six pins spread throughout my PCB. This was a lot easier than fighting to squeeze my programming header into the board. The entire audio circuit is powered by a LM7805 which keeps my 5V rail constant. This keeps my audio waveforms from changing as the battery voltage changes. 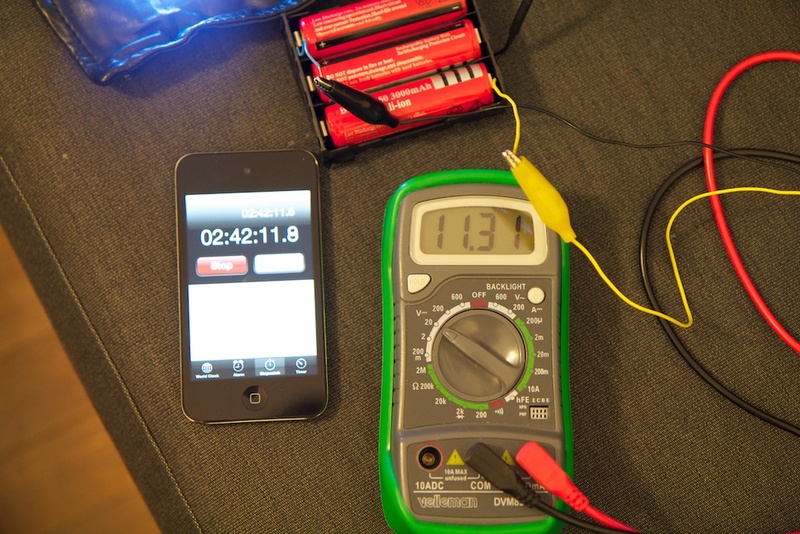 It also allows me to accurately measure the battery voltage as it dies down (that’s what the R9 and R8 divider is for). 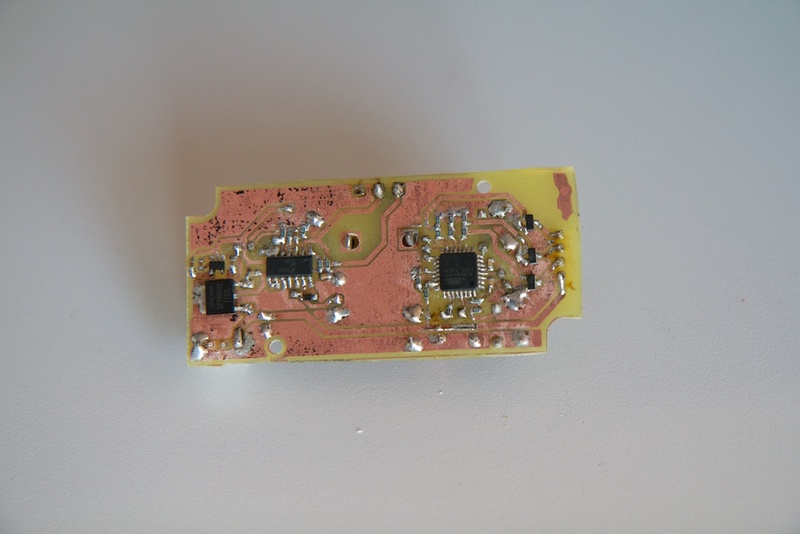 I was really amazed with how clean my PCB came out. I was using a new piece of copper clad this time that I had just ordered, and I think it is a lot thinner than the old stuff. It etched a LOT faster (45 minutes as opposed to three hours), and there was very little pitting or undercutting. I was also pretty excited about the connectors and mating plug I used. They make the final product look really clean. This all fit really neatly in the jacket pocket. The jacket turned out to be really easy to work with. 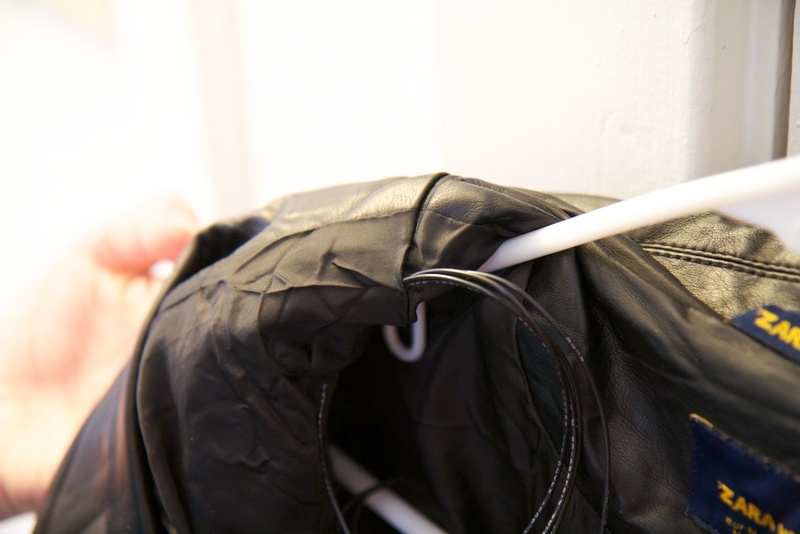 There is a cloth liner to the leather exterior creating a gap that wires fit through easily. The plan was to have a single strip that runs up one side and down the other around the collar along with two strands around the sleeves. 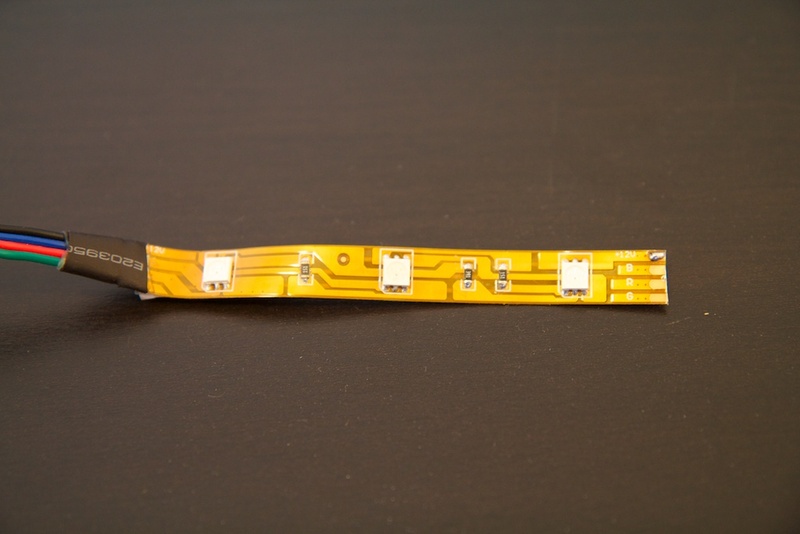 What’s neat is that because the LEDs are all in parallel, it was easy to tap into a convenient point along the main strip to attach the wrist LED strips. 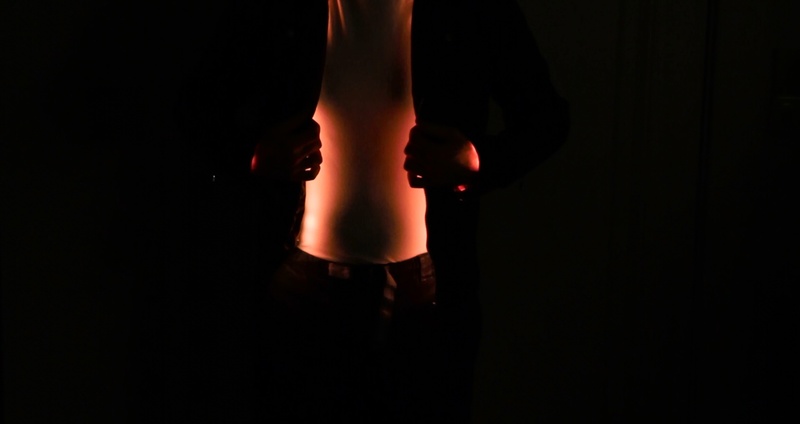 I might look a little stiff in the video below, but that’s only because I was trying to get the wrist LEDs to light up my hands as much as possible. The jacket is actually quite comfortable and flexible. This thing started at 12.20V and isn’t even close to the 9V cut off after nearly three hours. Three hours is super long when you consider that it will actually be blinking during a performance and will probably use less than half the power I’m using here. This is my first ever commissioned piece, and I had a lot of fun making the final product well polished and easy to use. I’ll be mailing it off tomorrow. And here’s a photo of my client wearing it. I think it looks pretty swanky. 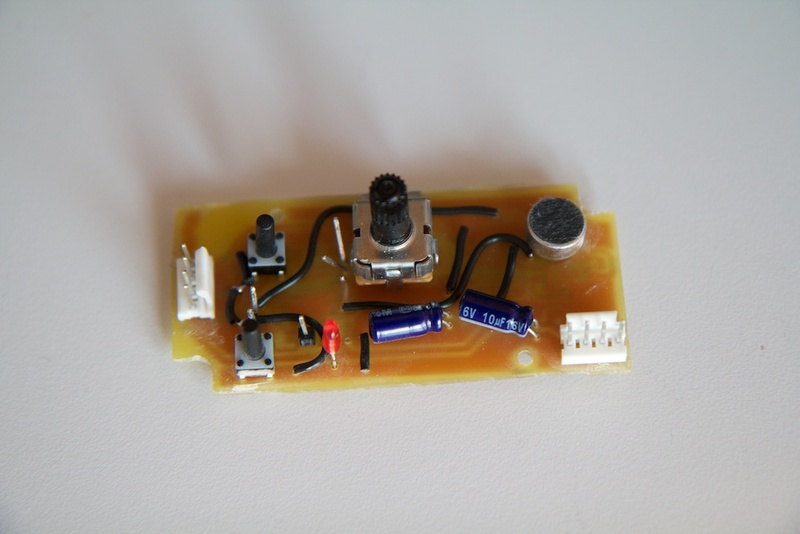 This entry was posted in DJ Jacket and tagged clothing, led, pulse width modulation by ch00f. Bookmark the permalink. Nicely done! Hope you have time to continually work on projects like these. Great projects and wonderful blog posting, but I think you should keep some of the technical stuff to yourself and use it in your arsenal of marketable skills. Someone will ‘rip off’ your projects and make a pile of money at some point. Nothing wrong with protecting your intellectual property. Cheers! You’re missing the entire point of the blog! I hope that someone rips off my ideas! I already have a job and make enough to get by. My hope is to inspire others to learn what I’ve learned and empower them to make their own ideas into a reality. A true master of his craft! As a technical person who loves technology, all I want is to see progress, growth and innovation. You’re a legend. Not to criticise but why you still etching your own boards? yes fast but there are really cheap fab houses out there.. plus you can brand your boards like a business cards, should anyone enjoy the work. I also noticed you use a lot of plastic enclosures… ever think about getting the MakerBot personal 3d printer for your own enclosures? thats on my wish list for next christmas should my wife ever allow me to get one. Anyhow keep up the great projects ! I have actually considered getting a makerbot printer. I’ve actually got a hand mill which when combined with the enclosures off Digikey works out pretty well. I might get the printer to help with some of my more bizarre enclosure needs. I’m actually at the point now where I can print a board in a number of *hours* for maybe $2 (with maybe a 90% yield) which for my smaller projects beats the pants off of even the cheapest fastest fab house. I had literally a week to design and build this jacket to make my deadline, so I would have paid out the nose at Advanced Circuits or whoever else. I had a question that I wanted to ask, im making a jacket for a very big pop star, you can probably guess who it is, and I really wanted to know if you could help me out by also putting lights in the jacket that I have bought. 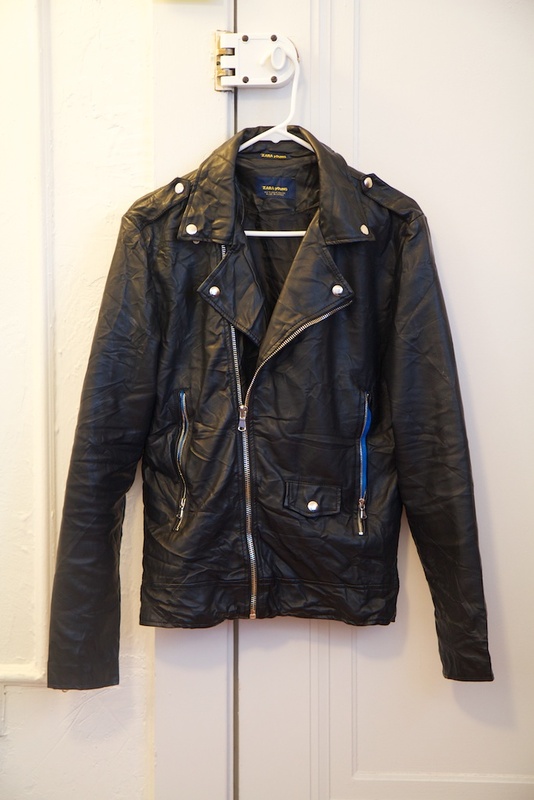 It is a leather jacket, and the jacket will be given to her. 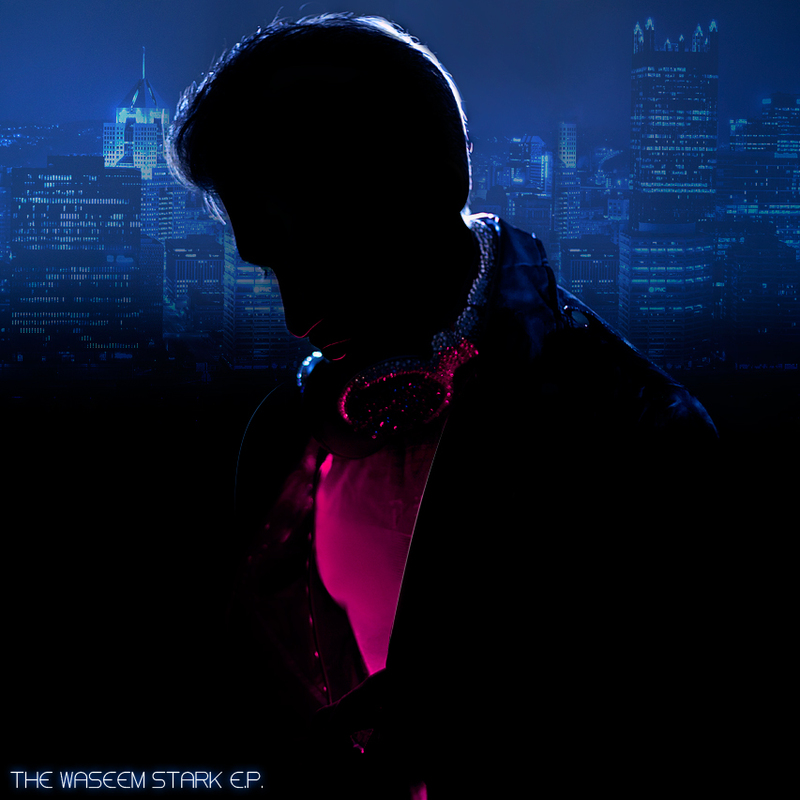 This will be the second one. If you can, please please pleasseeee contact me by email for more info. I sent you an email. Let me know if you don’t get it. Hi! Your projects are inspiring to say the least and I’d like to delve into similar projects on my own. 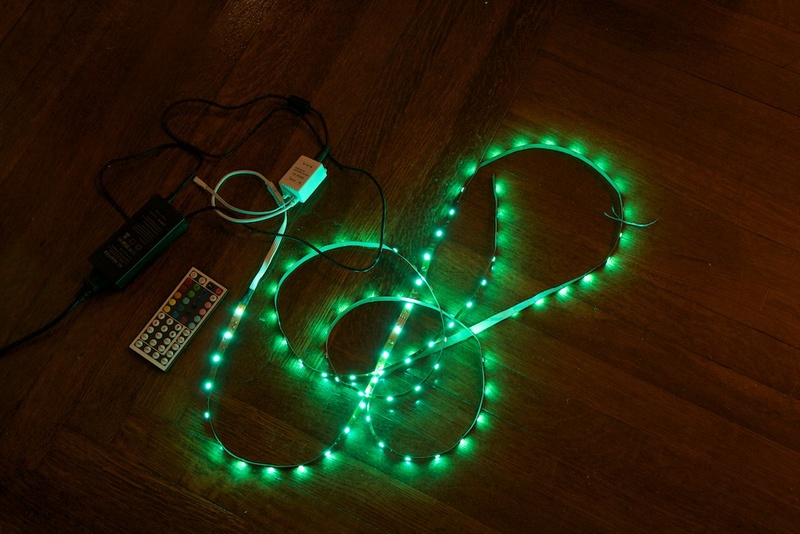 Would you be willing to refer me to resources you used to learn how to sync LED strips with music? All help is appreciated! 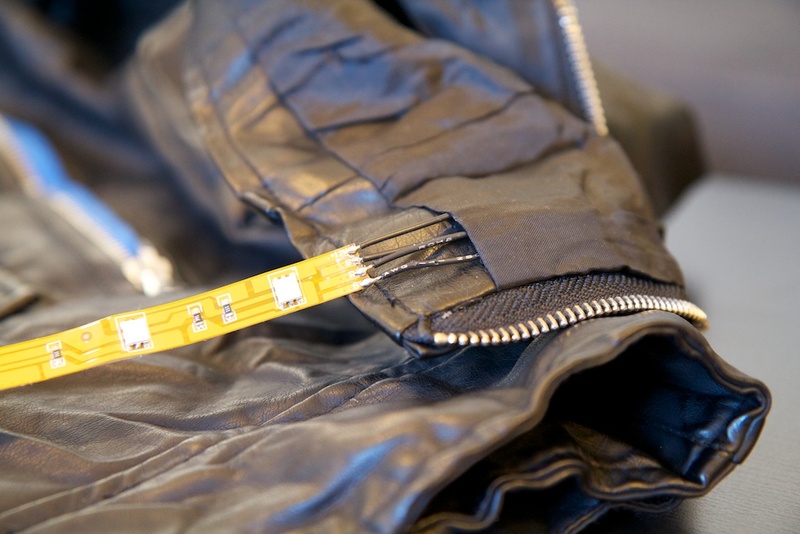 So as I was looking for a led leather jacket to by I came across your site. I am amazed at what you did with this jacket and was wondering if you had the time we could discuss price in making one, also if it could have lights not only on the inside but on the outside as well.